Transportation Costs > How Much Does a Farm Tractor Cost? How Much Does a Farm Tractor Cost? A farm tractor can be considered the most necessary piece of farm equipment a farmer should have. It performs a variety of farm tasks such as plowing, tilling, harrowing, shoveling, planting, hauling, transporting, lifting, and providing power supply. A farmer may buy a tractor with enough horsepower to do the work needed. When you buy a tractor with more horsepower, you also need to consider the cost of fuel and its impact on the soil. Other factors you need to consider, aside from the price of the tractor, is the design, the size, other features and accessories that go along with it. On average, be prepared to pay anywhere from $45,000 for a lower end used model to as much as $200,000+ for a farm tractor equipped with all the accessories that you need. Usually, tractors with about 25 to 28 horsepower can cost $4,000 and $18,000. A higher end, more powerful tractor with many features can demand a price tag as high as $150,000 or more. Small tractors with around 50 to 75 horsepower and no extra features can cost $20,000 and $40,000. If you want to have additional features and/or accessories, the price can be between the $100,000 and $150,000 range. Usually, the more features you add, the more you’re going to pay. Larger tractors with close to 100 horsepower can cost $50,000 to $110,000+. Again, the more features you add, the more it’s going to cost. There are tractors which are also priced more than $200,000, usually those with more than 150 horsepower. For instance, the John Deere 9630 4wWD tractor has a deluxe cab, active seat, deluxe comfort, 800/70r38 duals, radar, front and rear HID lights, AM/FM radio and electric mirrors. This model can cost as much as $275,000. For example, a John Deere 8210 has 185 horsepower and weighs over 8 tons. This particular model retails for $96,000 to $145,000. One of the great features is a radio in the cab so the driver can listen to music while working. Another John Deere — the 7810 — has 150 horsepower and weighs over 6 tons; this model retails for $78,000 to $93,000. Some tractors can cost more than $500,000 as pointed out by this 5 most expensive tractors post on rayblessed.wordpress.com. Today, farmers say it isn’t unusual to fork over $200,000 for a shiny new John Deere. Rich Taber at Cornell University highlights what people should look for if purchasing a tractor for their small farm. Explaining in depth, he notes a small farm owner should be prepared to spend $5,000 to $20,000 and up. This will depend on the age, the condition and features. We went ahead and researched top brands, with this information, we came up with the “average” price for a used model. In the table below, you will find the tractor’s brand, the horsepower and the average selling price. Since there are so many factors involved, it should offer a good idea of what it could cost. Liking purchasing a car, adding additional accessories can increase the cost. For example, a rake attachment can cost a few hundred dollars, while a loader attachment can cost $3,000 to $6,000. A backhoe attachment can cost $6,000 or more. The additional maintenance down the road that is required such as the oil changes, gas, battery charging, as well as repairs should all be included in your budget. Farm tractor insurance can cost about $3 per year per $1,000 in coverage for $500 deductible policy. This, however, can greatly vary depending on your personal circumstances. 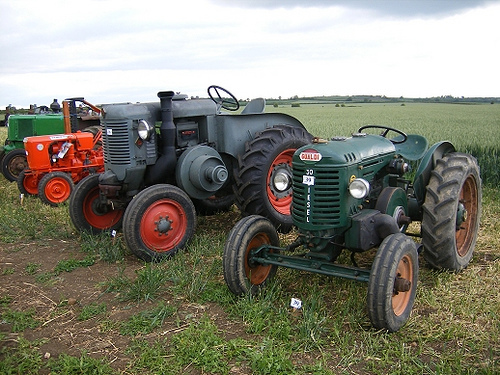 A well-maintained tractor can last more than 30 years if taken care of properly. Depending on various studies, close to 40 to 65% of the tractors out there are manufactured by John Deere. TractorHouse.com is a very useful resource that allows you to search equipment for sale, rent and lease. This can offer a better idea of what it may cost in your local area. For smaller homesteading farms (around 10 acres), 45 to 75 horsepower should be more than enough. Consider purchasing a pre-owned tractor. A few great places to start looking for used tractors are Craigslist and eBay. Due to the higher costs, many farmers can’t pay the costs up front. Most dealerships offer financing options for pre-approved buyers. If purchasing, highly consider going through the manufacturer since they can offer very lucrative rates. Since they aren’t in the business to sell loans, they will offer smaller interest-rate loans to sell their tractors. Like buying a car, a tractor can be leased as well. Smarterfinanceusa.com notes leasing a tractor will result in smaller payments and can save you on tax payments as well. Tax credits are often available through the federal and local state government. Talk with a local dealer or search to see if these options are available. Renting a tractor can be a viable option as well. Depending on the size, some tractors can be rented for as little as $0.16 to $0.23 per horsepower, per hour.